For users who are currently active within your app, FullStory offers you the option to fast forward to a live view within session playback. This can be especially helpful with chat or phone support, as well as an alternative option for screen sharing during conference calls. "User is active" will show up in green and indicates the customer is currently in the tab. "User in inactive" will show up in yellow and indicates the tab is in focus but the customer&apos;s mouse isn&apos;t moving. "Tab is unfocused" will show up in gray and indicates the customer is in another tab. In an effort to serve your sessions faster and to bring the most value to Go Live, sessions will be available instantly for viewing. The newest sessions will show up at the top of the user list. How does Go Live interact with integrations? Several of our integrations, such as Olark, Intercom, UserVoice, and Desk have built in links that will allow you to quickly jump into sessions where Go Live is active (assuming you&apos;re responding to conversations immediately upon receiving). When you click on the session link, you&apos;ll be taken to the beginning of the session. 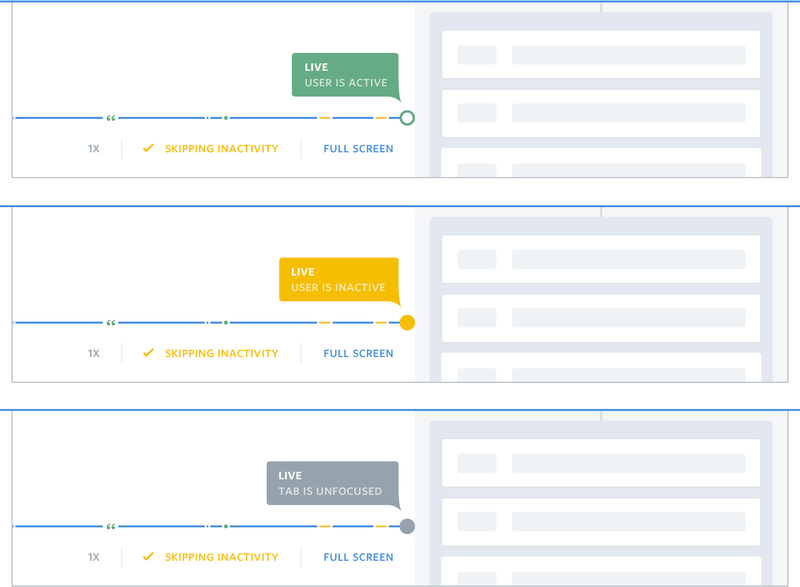 Click on "Go Live" to be transported to the real time view of your user&apos;s interactions. Additionally, you can use FS.getCurrentSessionURL to add a FullStory session link to your support tickets or other workflows. This will deliver you a curated list of live sessions ready to go! Why don&apos;t some of my "online" sessions show the Go Live option? Our online indicator in search results is indicating sessions that have had activity in the past 30 minutes and are not yet closed. It is possible for some of these sessions to no longer be recording an active user, in which case we will not give you the option to Go Live.